GALION — The Galion-Crestline Area Chamber of Commerce held its Candidates Night at Galion Community Theatre on Thursday. Chamber President Joe Kleinknecht welcomed the crowd of more than 100 and thanked Galion Community Theatre for donating the use of the facility. Kleinknecht recognized Chris Stone with Rock Solid Media who live-streamed the evening, and also to GHS Government teacher Bill Stepro and his class who presented the questions to the candidates. The four GHS students who comprised the panel were junior class officers Sari Conner, Alex Eckert, Abby Foust and Clay Karnes. 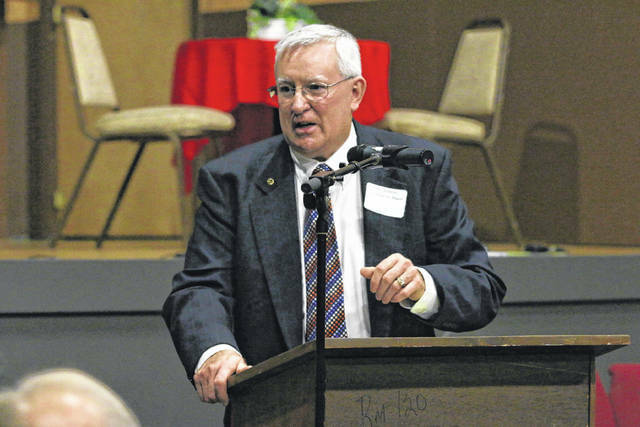 LaMar Wyse, a retired healthcare executive and Galion resident, was moderator. Several candidates were missing, after having to have their own get-together a few blocks away. The first candidates to speak are unopposed: Carl Watt and Bill Comerford. Also running unopposed is current council member Mark Triplett who was not in attendance. Next to speak was candidate Mike Richart, who is running against Joe Haley for the 3rd Ward seat. Haley did not attend the event. Jennifer Kuns is running for the 3rd War council seat against Tammy Siclair-Erlsten. Kuns spoke about Galion’s spending as a balance to the current and future electric rates. She is hopeful that with better negotiations in employee benefits and contracts, future employee retirements that may not need to be replaced, and a line item of the Electric Fund that can be moved to the General Fund, will all help to save money. Kuns is an eight-year member of the Galion school board, a Vice President at United Bank of Galion, and has served on the board of directors with the Galion-Crestline Area Chamber of Commerce. Her opponent did not participate Thursday. Dr Tom Fellner, Shirley Clark, and Gail Baldinger — three of five candidates running four three council-at-large seats, were next. Clark talked of her accomplishments in the Parks and Recreations Committee. During her time on council, she said, the committee has helped to finalize the Disc Golf course at Amicks Reservoir as well as the splash park facility at East Park. “We should be proud of what we’ve done,” she said. Baldinger was a Galion firefighter and was president of the local International Association of Fire Fighters union. During that time he said he negotiated contracts between the city and the union. He also worked as a road maintenance equipment installer for 14 years. At-large candidates not in attendance were Alice Mathews and Carrie Zeger. Current director of law Tom Palmer encouraged residents to think ahead when voting in the election. Palmer is running against E. Roberta Wade, who is not in attendance. “I urge you to choose a positive path for our future,’ he said. An attorney for 25 years, Palmer noted that while his position is more involved than he could’ve imagined, he has enjoyed it immensely. City auditor candidates Brian Treisch and Susan Bean were asked what they felt was the biggest financial challenge facing the city of Galion, and how would they address it? Treisch, the incumbent auditor, was asked as to what he felt was the necessary steps for the city to be released from fiscal emergency? Mayoral candidates Ken Bodkins and incumbent Tom O’Leary were the last to speak. Candidate Jim Hedges did not attend the forum. They were asked about the city’s greatest challenge and its greatest opportunities. “We also have to generate business. And I don’t know how to do it except to work hard. Get on the phone and talk to the right people,” he continued. O’Leary discussed his reason for becoming mayor. Erin Miller | Galion Inquirer Galion mayoral candidate Ken Bodkins addresses a crowd of more than 100 residents during a candidate’s night event Wednesday at Galion Community Theatre. Bodkins is running against incumbent Tom O’Leary and Jim Hedges. Candidates were questioned by members of the junior class officers at Galion High School. https://www.galioninquirer.com/wp-content/uploads/sites/38/2017/11/web1_Ken-Bodkins-1.jpgErin Miller | Galion Inquirer Galion mayoral candidate Ken Bodkins addresses a crowd of more than 100 residents during a candidate’s night event Wednesday at Galion Community Theatre. Bodkins is running against incumbent Tom O’Leary and Jim Hedges. Candidates were questioned by members of the junior class officers at Galion High School. Contact Erin Miller at emiller@aimmediamidwest.com or 419-468-1117, ext. 2049.